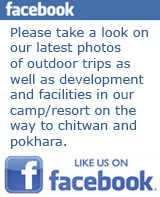 We welcome you to our Camp/Resort!!!! 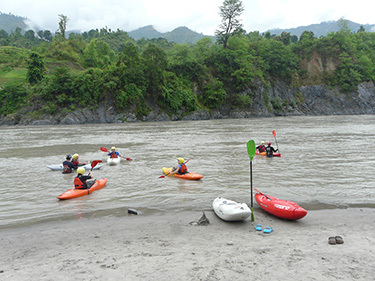 Our Resort is located on the bank of Trisuli river and it’s right on the river’s most famous rafting put in point for all the seasons (It is called Charaundi and is 82 km from Kathmandu in the direction of Pokhara and Chitwan). 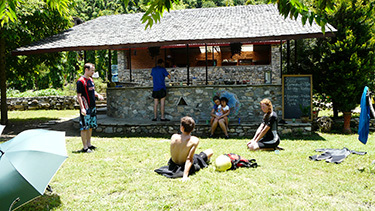 It is green space with trees, organic garden and a sandy beach for relaxation by the river. 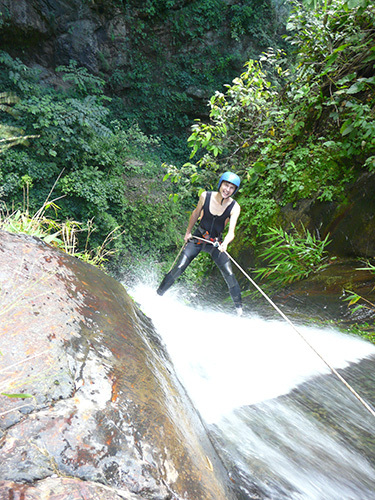 The camp & resort serves as a base for adventure activities like rafting, kayaking and canyoning (abseiling on the great natural waterfalls). 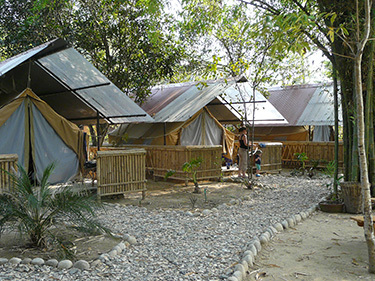 The Camp/Resort has comfortable safari tents with beds inside as well as camping tents if you prefer. 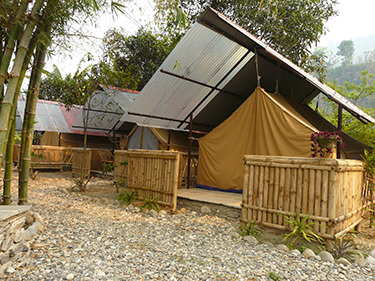 There are also toilets, with cold and hot water, a dining hall and a kitchen. 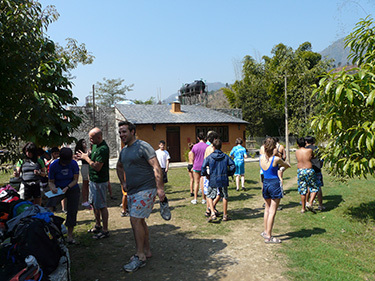 This place is perfect for overnight stays, relaxations, adventure activities or just for a short break when you are driving in between major tourist destinations (from lake city Pokhara about 120 km. from Chitwan Sauraha 85 km.). Beautiful autumn mornings, warm days and pleasant evenings are all enjoyed right here! 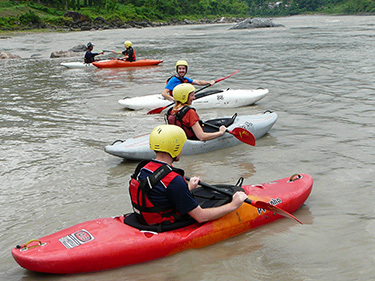 So please come and stay at the Resort and or enjoy Whitewater rafting/kayaking on the great rapids of the main exciting Trisuli river; or just do BOATING in front of our resort with your family and friends. There is no age limit for a boating trip! 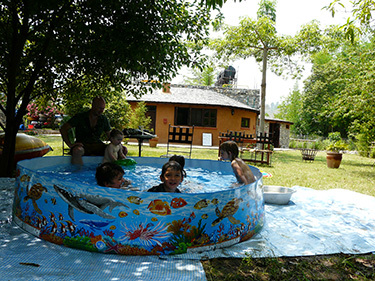 There are exciting waves and you can spend hours enjoying the river, kids love it! We guarantee a 100% safe boating trip for your family and friends. 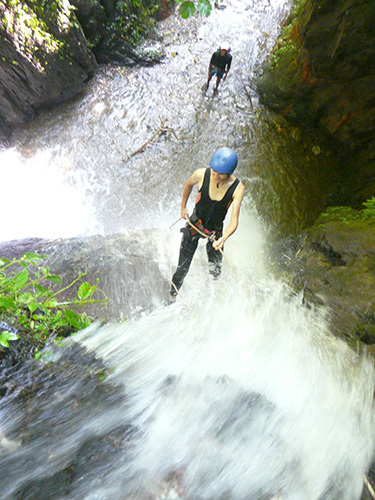 If you like to learn to kayak or to sharpen your kayaking skills - this is the best location for a beginner kayak course before you attempt to run class 3 rapids. Are you Interested in learning to kayak with us starting from very safe location with an equipped facility and build your confidence on the water? 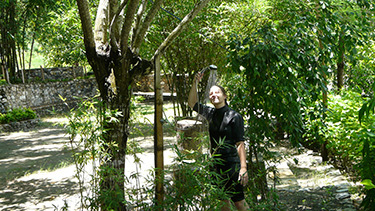 Just visit our Camp/Resort we are properly equipped and ready to fill your needs! 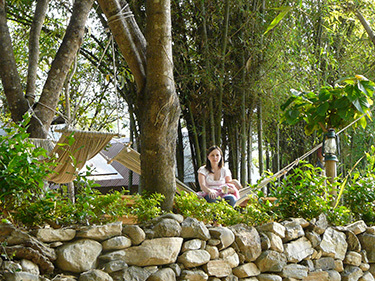 You are welcome to enjoy exciting outdoor activities or just to rest and enjoy your time at the Resort with a book in one of our hammocks, with cup of organic coffee , herbal tea or bottle of beer. 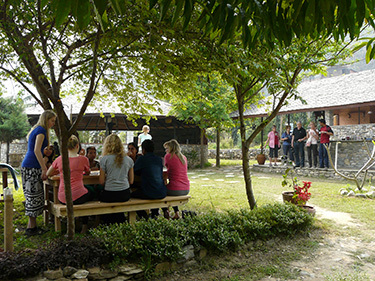 Be it just for a day trip or for overnight camping by the river, BBQ dinner and candle lights under the sky. 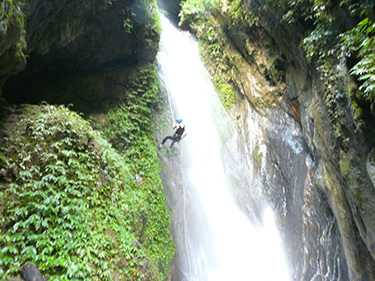 It’s a perfect holiday place for those who want to experience something unique . If you like to make an exciting week-end with your kids and to spend quality time in nature but with a comfortable stay - you are more than welcome! 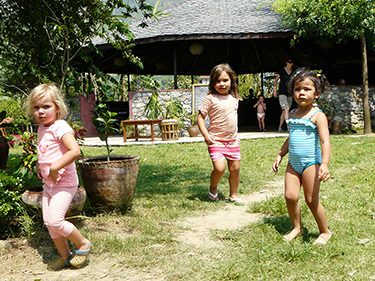 We have lots of exciting outdoor activities for kids to enjoy and to be more connected with nature! We have exciting news: our café is open now! So if you’re just driving between Kathmandu – Pokhara –Chitwan-Lumbini stop by and refresh yourself with organic coffee from Nepal as well as a variety of teas, smoothies and fresh juices from our own organic produce.